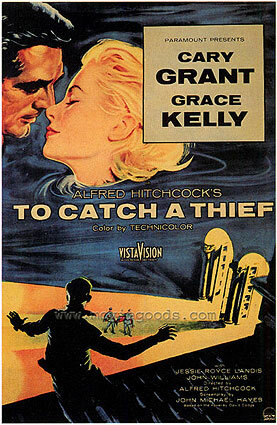 Who’s the thief and who’s catching him is the big question in this racy flick by the masterful Alfred Hitchcock. Set on the French Riviera at a time when quiche Lorraine was still novel, the film tells the tale of a notorious cat burglar John Robie (Cary Grant) who is being blamed for a recent spate of jewellery thefts. In order to vindicate himself, Robie devises a plan to infiltrate the company of those he suspects will be his copy cats’ next targets; the lushy American oil millionairess Mrs. Stevens (Jessie Royce Landis) and her alluring daughter Francie (Grace Kelly). This was the last film that Kelly ever made before morphing into the Princess of Monaco but for legions of fans she was already screen royalty. Cast opposite one of the handsomest princes around, she is the personification of glamour, wafting around in diaphanous strapless gowns created by the legendary Edith Head (who always gave good wardrobe). Kelly has many marvellous moments as Francie, like when out of the blue she plants a big wet one on her co-star without batting an eyelid, and when she suggestively taunts him with diamonds – the only thing in the world he can’t resist – while fireworks climax in the sky outside. There’s even a prophetic scene where she’s at the wheel of her convertible speeding along the precipitous coastal roads that would later claim the actress’s life. John Michael Hayes wrote the snappy dialogue with some extra re-writing by Australian Alec Coppel who went on to co-write Hitchcock’s highly personal Vertigo. It was shot in VistaVision, a widescreen format that captures the full beauty of the unspoilt landscape and helped win cinematographer Robert Burks an Oscar. As the travel poster that opens the film says; ‘If you love life, you’ll love France’. And if you love France, especially in its glory days, then you’ll love To Catch A Thief.